I have been on a lifestyle book kick lately. I have bought a handful of them and like at a salad bar it is easy to pick and choose the advice you want to take away from the books. I can't get behind all of the advice and while the books are plant based they are not 100% vegan. Oh and quinoa is a major book trend! I hate you quinoa! Food is trying to kill me! Here is a rundown of the books, what I liked mostly. The points I did not care for in the books are all very similar: restrictive, stuff that is necessarily good deemed bad and way to much emphasis on detoxing. My favorite out of the bunch is Relish by Daphne Oz. I did not even know who she was till I saw her in Cosmo (I think) and liked her plate collection and her popcorn with coconut oil snack idea. I started watching The Chew (I was not aware of the show - though I do know the other hosts from various shows!). Relish is more like healthy, happy and fun living rather than diet and green smoothies. Daphne comes off as a way less pretentious Martha Stewart who also is a lot hipper. There are a few noted vegan recipes, some that would be a cinch to make vegan and day to day advice that puts a smile on your face. Undiet by Megan Telpner was a purchase after I seen it on a blog tour. I like that it includes some beauty info - though the DIY beauty recipes are not vegan, and would not work the same if made vegan. It is a good source to show you how to clean up your routine in the kitchen and outside it. 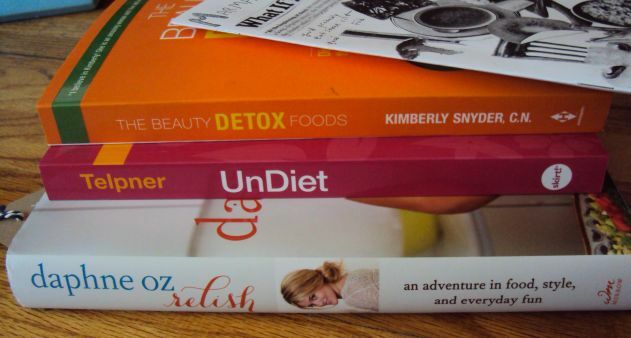 Kimberly Snyder's The Beauty Detox Foods is good at showing you food to consume to address skin, hair and nail needs. It looks like a mighty book but I feel there is so much more that could have be said. This is the most 'diet-y' of the books and a lot of the food advice is not something I would live on day to day. There are a lot of salad and dressing recipes - perfect for upcoming warm weather eating! Also over the weekend I got the new issue of Marmalade Umlaut - I skimmed through it in the car and read it on Monday. 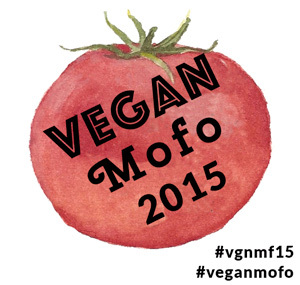 If you want to get your own copy or check out some vegan food action head on over to Food Feud today! I have more books to talk about later. Then I am going to try to say no to books for a bit to cool my credit card! Books are so tempting - like vegan brownies!